RUNOFF-100 Surface Active Spray Adjuvant Runoff-100 is nonionic, colourless, slightly viscous and biodegradable solution that enhances the activity of insecticides, fungicides, weedicides, foliar fertilizers and plant growth regulators by spreading them uniformly, sticking rigorously and activating violently. Runoff-100 reduces the surface tension of water thereby helping in fast and uniform coverage of pesticides, enhances their sticking properties and increases the activities through fairly good penetration and translocation of pesticides in plant system even at lower dosages. Pesticides do not run off, even if it rains after spray. Persistence of pesticides increases on waxy and hairy leaves. Runoff-100 works very well even at pretty low dose. Add just 5 ml of Runoff-100 in 15 lit water tank and mix with recommended dose of pesticides or other spray product Runoff-100 is a tried and tested product at National Horticultural Research and Development Foundation, Nashik, Gujarat Agricultural University, Anand and Mahatma Phule Krushi Vidyapith, Rahuri. Runoff-100, because of its Nonionic constituents, does not contain any ion like Sodium, Calcium, Magnesium, Chlorine, carbonate, bicarbonate etc. which have negative bearing with the normal functioning of the crop plants. How Runoff-100 is better than other ionic surfactants Ionic surfactants contain only 12-13 %w/v of surface active agents and that too of ionic nature while that of Runoff-100 contains 80 % w/v as surface active agent in NONIONIC form. Ionic surfactants contain 37-38% synthetic ester resin also , which may react with spray admixture candidates like chemical pesticides, fungicides, fertilizers etc. Runoff-100 is free from any synthetic resin like chemicals. Ionic surfactant may not be stable in alkaline, acidic formulation as it contains resin, which may be hydrolyzed in some pH conditions, Runoff-100 can not be reactive in any pH conditions. Runoff-100 is biodegradable while that of ionic surfactants, they do not get degraded biologically. Runoff-100 contains more powerful non-ionic surfactant than other similar products so as to enable inputs spread and activate faster. Other similar products are biodegradable while Runoff-100 is partially biodegradable and there by works, retains pesticides for longer time. This is how it is effective for longer period than other similar formulations. Runoff-100 is cost effective Runoff-100 as Spreader : Provides more uniform spray deposit on plants, improves coverage of herbicide and fungicide sprays. Runoff-100 as Activator : Through wetting action, it helps improve performance of post-emergence herbicides, insecticides and fungicides. Increases water penetration, percolation and spreading in soil strata. Aids irrigation by increasing rate at which water soaks into soil. Promotes water use efficiency. Reduces irrigation water run-off. Field Dosage Apply Runoff-100 @ 5-10 ml/15 litre water along with all spray inputs. SAFFRON sulphur 40% sc Fungicide and Miticide Saffron is sulphur 40% suspension concentrate in colloidal form with particle size less than 3 micron. Hence it works excellent against fungi and mites. Spores of powdery mildew is made up of carbohydrate surrounded by layer of oil globule. Saffron when comes into contact with oil globules, breaks oil globules easily and reacts with carbohydrate. Hence spores of powdery mildew are killed easily. After killing the spores, saffron gets converted into sulphide form on the surface of leaves and reacts with oxygen and gets converted into sulphate form (SO4) which can easily be absorbed by the plant. Hence by applying SAFFRON, we can control fungi, mites and get fourth major nutrient useful for the crops. It has no scorching effect on tender leaves, berries or fruits. It is recommended to use in cucurbit crops also even when day temperature is higher. Saffron, because of its particles less than 3 micron, exerts activities very fast and as the fourth major crop nutrient, it gets converted into sulphate very fast. This is the key for enhanced activity of Saffron. Saffron is nonreactive with other spray inputs thereby can be tank-mixed with any spray input. 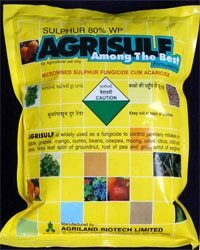 Use of Sulphur is approved by the International Federation of Organic Agriculture Movements, Germany and All India Federation of Organic Farming, Mumbai. DEBRISTA Microbes for all Wastes Composting Debrista is a group of aerobic microbes for composting farm wastes, green kitchen wastes, gardens and city wastes. Use 1 kg of Debrista for composting 1 ton of any waste. Make slurry of Debrista & water and mix thoroughly with wastes. If the waste is too wet, use powder directly onto the wastes. Make heaps of treated wastes at a height of about 2 metre. Keep turning the heaps at an interval of 15 days to trigger aerobic composting faster. Maintain moisture level of 40% throughout composting. When compost gets cooled and soft, it is an indication of composting being over.